The Destiny Quest Mobile App brings your school library to the devices that students use most. Now they can visit and search the library anytime, from anywhere. With the new Destiny Quest mobile app, students can search and access library resources in a way like never before--from their iOS or Android mobile devices. Which means they can now find learning resources they need anytime, even after the school day ends. Plus it gives media specialists and teachers access to navigate the library and plan lessons, assignments and activities. Students can even view books they have checked out and outstanding fines. Best of all, this easy-to-use, intuitive learning application is free to download and available with your current Destiny subscription. Search for resources in your library. 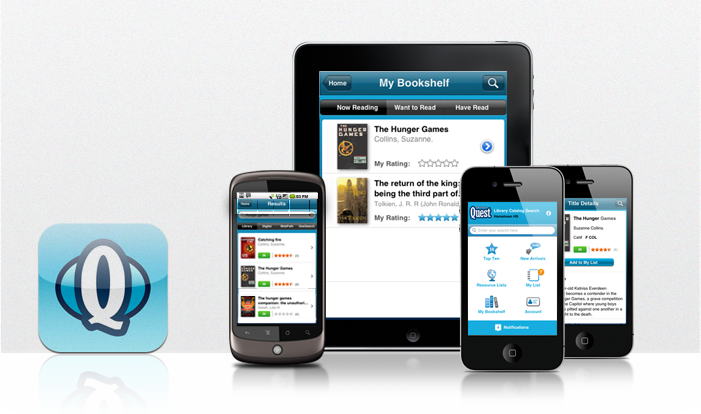 Checkout Follett ebooks to phone. Discover the Top 10 Most Popular titles and New Books at your library. Note: Destiny Quest will continue to allow connectivity to Destiny version 10.0 or later. View Account information including checkouts, holds and outstanding fines. Use Resource Lists posted by teachers and media specialists to find materials on topics discussed in class. Submit and read ratings and review from other students. Place holds on books and add items to My List. Students can easily maintain lists of books they are Now Reading, Want to Read, and Have Read. Your library will need to be updated with Destiny 10.0 or higher to use the Destiny Quest mobile app. You must make your Destiny accessible on the web and provide students with usernames and passwords to provide full accessibility and functionality for students. You will also need to enable Destiny Quest. Compatible with iPhone, iPod touch and iPad with iOS 4.2 or later. Requires Android 2.1or later. Promote the Destiny Quest Mobile App in your Library. Click here to download the Destiny Quest Promotional Materials. You will be able to use these features once your school media specialist has set up access. To get started, view our detailed demo video- How to Use Destiny Quest Mobile App. Contact your school's media specialist if you have any questions or need further assistance. Want a better eBook reading experience? Using the Destiny Quest mobile app, students can browse their library’s Follett eBook collection, check out a Follett eBook using the BryteWave K-12 Edition app and read their Follett eBook – anytime, anywhere – from a tablet device and a phone. Best yet, the BryteWave K-12 Edition app is free for Apple IOS and Android. Visit www.aboutfollettebooks.com to learn more about getting the ability to access and read Follett eBooks on the BryteWave K-12 Edition app. Login or fill out your contact details below. © 2019 Follett School Solutions, Inc. All Rights Reserved.